There was a time when I couldn’t handle any extra attention. I know. It’s hard to believe. I hid behind my friends in high school, self-conscious about my looks. I used makeup and a curling iron in order to fit in and to prevent standing out. Something has happened to me. I am not sure when the turning point occurred. Did it happen when investigating a story for a blog post? Have I finally reached the age when I don’t get embarrassed and have no shame? Could I be getting more comfortable in my own skin? 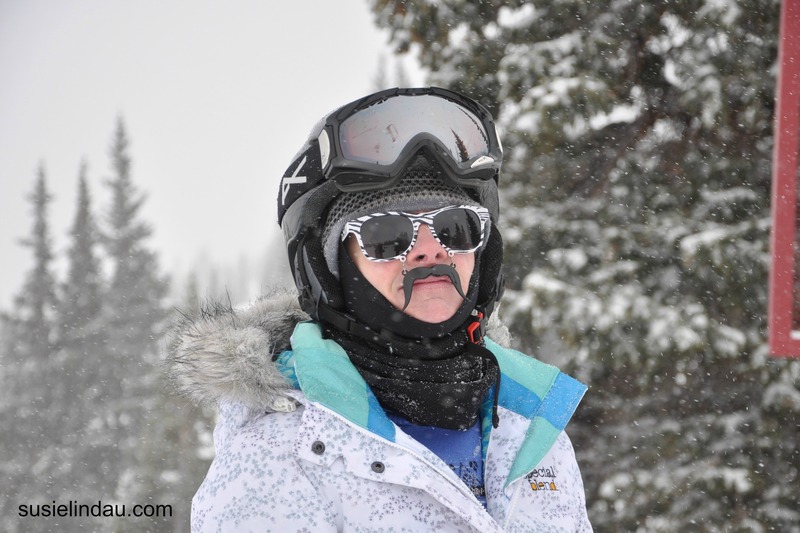 Whatever the reason, after winning Go Jules Go ‘stache glasses giveaway, I had no problem popping them on in the Breckenridge parking lot last weekend. The carload next to us roared with laughter. Young children stared. Middle schoolers rolled their eyes. 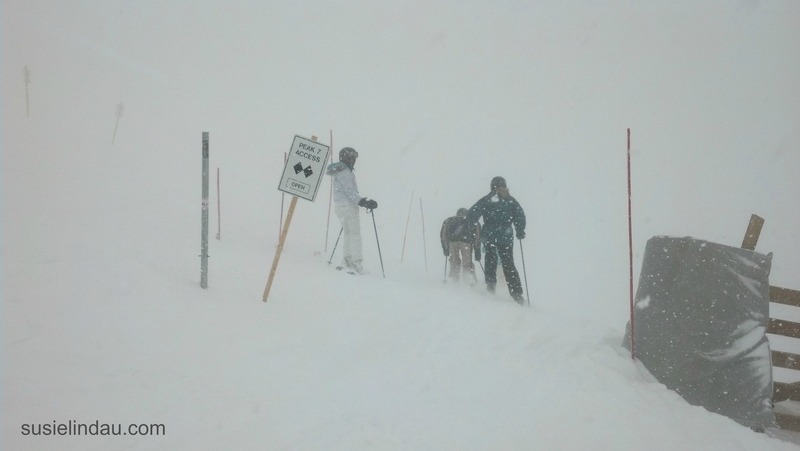 Okay, I couldn’t see their eyes since it was snowing and everyone wore goggles, but hey, I am sure they were rolling. Some checked me out while pursing their lips and then gave me a, “Yeah. I’ve seen those glasses around,” look. Most smiled and a few guffawed. I had only planned to wear them for one or two photos since the snow came down in buckets. Sunglasses were impractical. Not one person wore them. 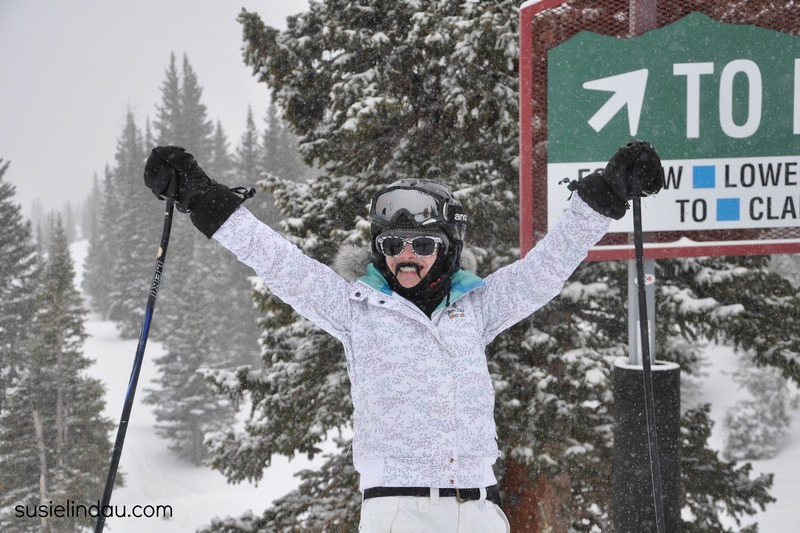 After I reached the summit of Peak 8, I gazed down our first double black diamond run of the day. Only a blank white canvas lay beneath me. I had no depth perception. My skis would soon slide over a head wall. I put the shades in my pocket and slipped on my trusty goggles. The amber lens really flattened the light. Taking out the glasses again, the dark lenses were just what I needed to define the moguls and choppy heavy snow. I rocked the shades all day. 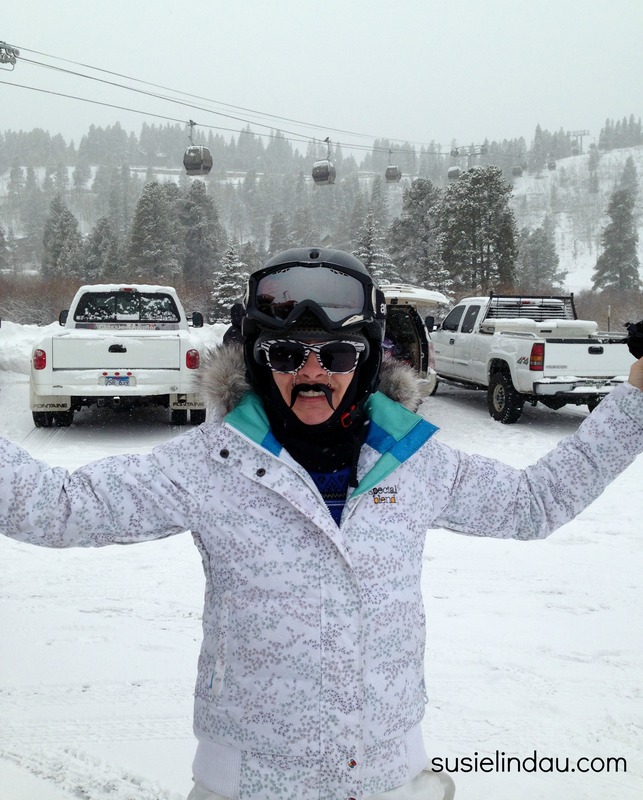 When asked about my mustachioed appearance I said, “It’s mustache March! I tried growing my own, but gave up.” Many men sported full facial hair, but very few had gotten the memo about shaving their beards. Others said they were too committed to their facial forest. Now I know why guys love growing beards. That plastic placebo kept my face warm. Really! When I first tried them on, my husband Danny said I reminded him of Sony Bono. 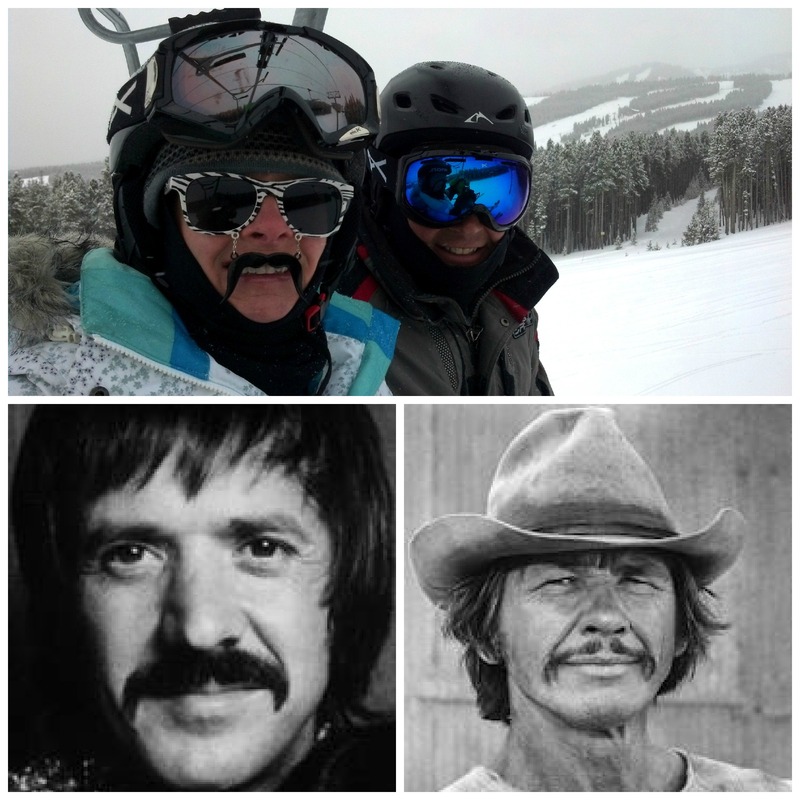 After skiing a while, he glanced over at me and decided I resembled a young Charles Bronson. You may think it was easier for me to be outgoing while hiding behind my shades, but I welcomed the knowing smiles. So a big thank you goes out to Jules and all my blogging friends. Without you, I may still be hiding behind the crowd instead of causing a stir. I am definitely wearing the ‘stache glasses to my tennis match tomorrow. Maybe my opponent will be intimidated by my Charles Bronson sneer. Are you coming out of your shell as you get older? A Jig From Your Irish Lass! LOL I loved the look! hahahahaha I always said you know you’re getting old when your chin hair outnumbers your teenage son’s! Thanks for the laugh. Hahaha! That’s a good one. ….runs to check mirror…. . Thanks for stopping by! I thought of Sonny Bono as soon as I saw that first picture of you. It’s amazing how much a little facial hair can change your entire appearance. I had a mustache for many years, and when I shaved it off, a lot of people didn’t know who I was. You’ve definitely come out of your shell, Susie. 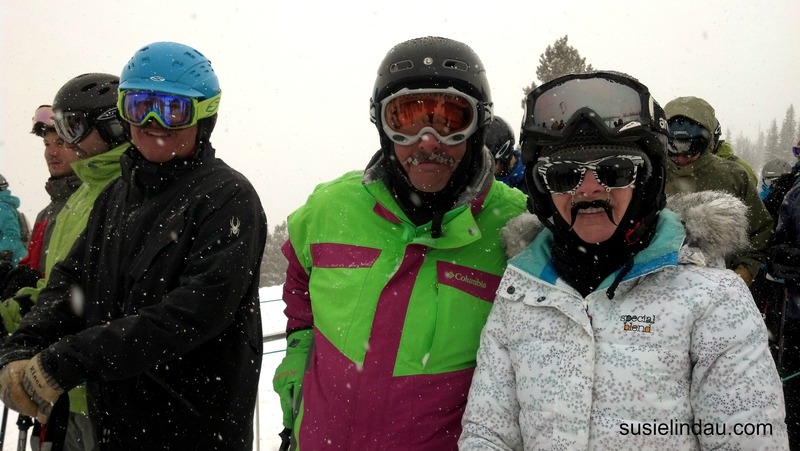 Way to rock the ‘stache, Susie! Thanks Hook! It was a fun day in the snow! 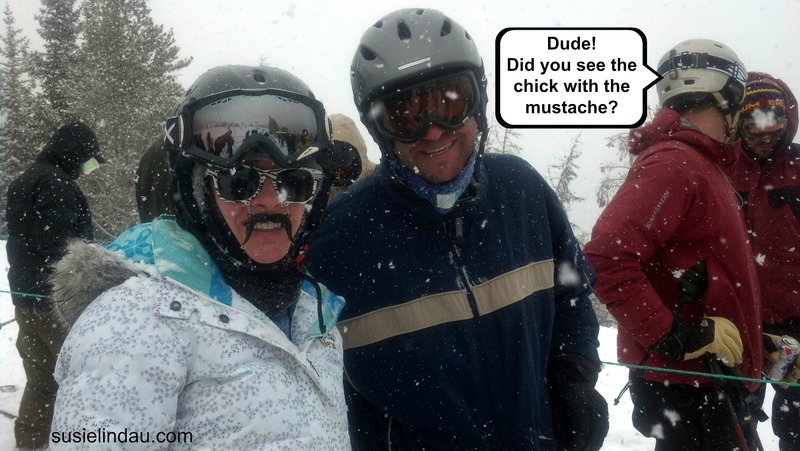 I love your Charles Bronson mustache … I’m sure that it made you look even cooler while sloshing down the slopes. How was your tennis match? That ‘stache kept me warm too. Bonus! The match went well. Thanks! I bet you could get double takes on the beach with a pair of them Guat! HA! Depends on the beach … If it’s Malibu or Santa Monica probably…If it’s Venice, I’m just one of the unique residents. That is true! I remember all of those beaches! I bought wrap arounds and black and white checked sunglasses at Venice Beach in the 80’s! Love this! I really think that it’s when we go out of our comfort zone & do silly things that we finally realize: We’re usually the only one ever passing judgements on ourselves! No one else cares! I remember I wore a fake mustache around the mall one day years ago, and the majority of the people were laughing right along with me. Great stuff.